Chinese food is extremely popular world over. And I am sure many of you must have noticed that it tastes different in different parts of the world. Keeping the basic essence in place, Chinese restaurants all over the world modify their dishes blending it with locally available ingredients and make it suited to palate of the local populace. Chinese restaurants in my home town Kolkata, India is no different. One of the most popular dishes in Chinese restaurants in India is Chili Chicken. You can't find 'Chili Chicken' any where else other than India and Indian restaurants outside the sub-continent. 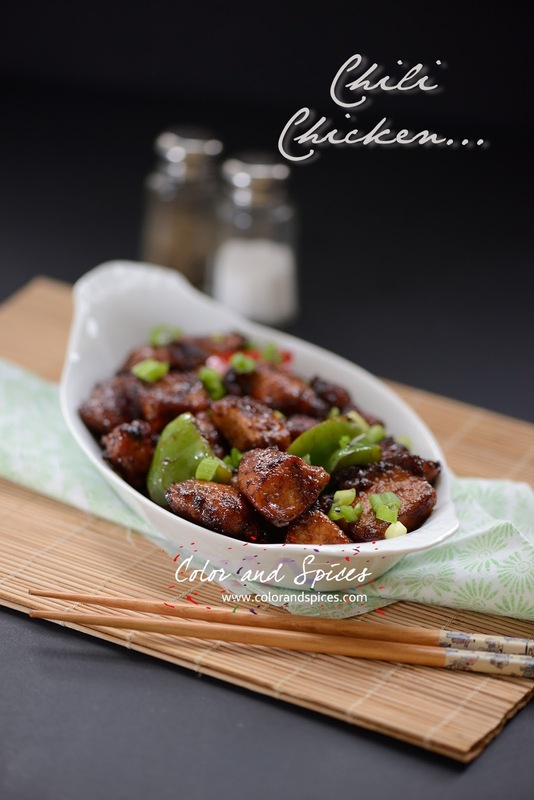 Chili Chicken is stir fried chicken pieces cooked in a spicy soy sauce based gravy and is the most popular Chinese dish in India. And Chinese food in India comes with something special, a bowl full of green chilies soaked in vinegar. I personally think my Chinese dinner or lunch is incomplete without that bowl of vinegar soaked chilies. 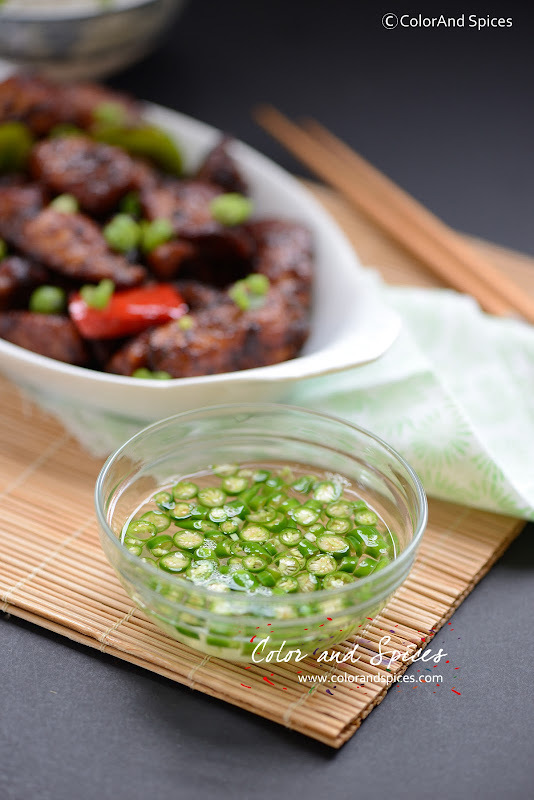 It is very easy to make, chop fresh green chilies and soak them in white vinegar for 6-8 hrs. You can store that in an air tight glass jar for months. I often make Chili chicken and other Chinese dishes at home. Not only we all love it, they need very little cooking time too. The 'wok to plate' time being small for Chinese dishes, makes it very convenient when you want to treat your family with something other than the usual fare but do not want to break too much sweat. 1. Cut onion and bell peppers into triangles, keep aside. 2. Wash and pat dry the chicken breasts. Cut into bite size pieces. 3. In a bowl mix all the ingredients for marination. Careful while adding the salt, as soy sauce itself is very salty. Marinate the chicken pieces in the mix for 15-20 min. 4. In a wok or deep pan, heat 2 tablespoon of oil, preferably peanut oil, or any vegetable oil is good. When the oil is hot fry the onion and bell peppers. Keep the heat high, cook till the surface turns brown and blisters appear on them. Do not overcook, the onion and bell peppers should remain crunchy. Take out and keep aside. 5. In the same wok add more oil if needed, when the oil is hot fry the marinated chicken pieces in batches. Do not overcrowd the wok or pan, keep the heat to high. Cook for 3 min. Take out and keep aside. Repeat till all the chicken is done. 6. In the same wok add a tablespoon of oil, when the oil is hot, reduce the heat and add dry red chilies and sliced garlic, cook till the garlic turns brown, take out the red chilies and garlic with a slotted spoon. In that oil add the white part of the onion and cook over high heat for 2 min. Add the fried chicken, reduce heat to medium and cook for 2-3 min. Add green chilies, mix well and cook for another 1 min. Add rice wine (or sherry), dark soy sauce, sesame oil, mix well. Add the fried onion and bell peppers. 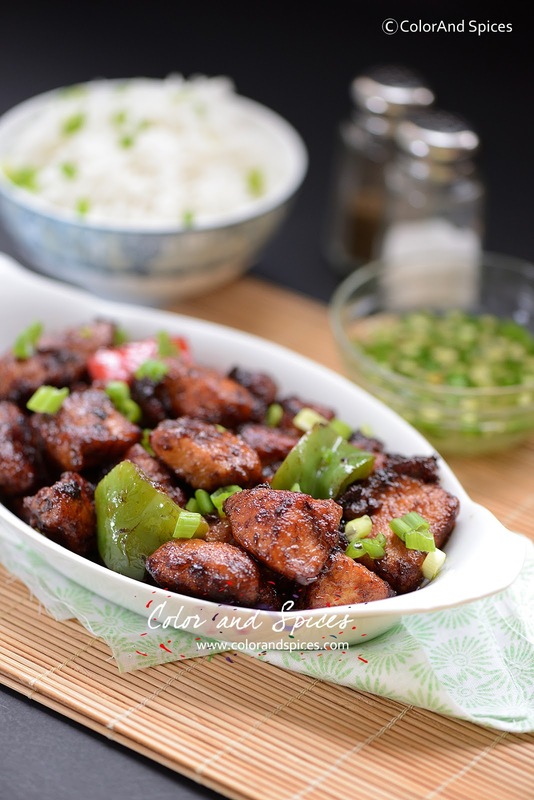 The chili chicken can be served like this, the dry version. 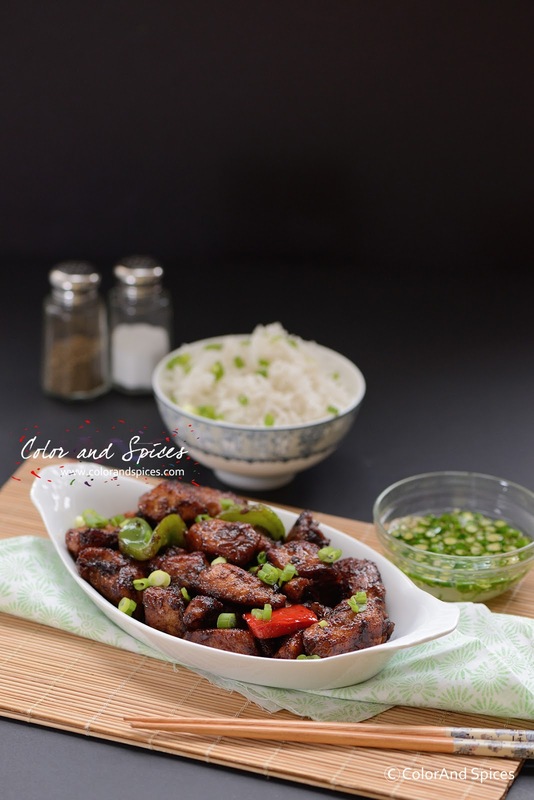 Garnish with chopped spring onion and enjoy dry chili chicken. If you like to have gravy in your chili chicken, then add chicken stock after step 6, and let it boil. Mix corn starch with some water. As the chicken boils add corn starch mix and switch off the heat. Garnish with chopped spring onion (scallion), only the green part, serve immediately. One of the most loved dishes in indo chinese cuisine. Love it.